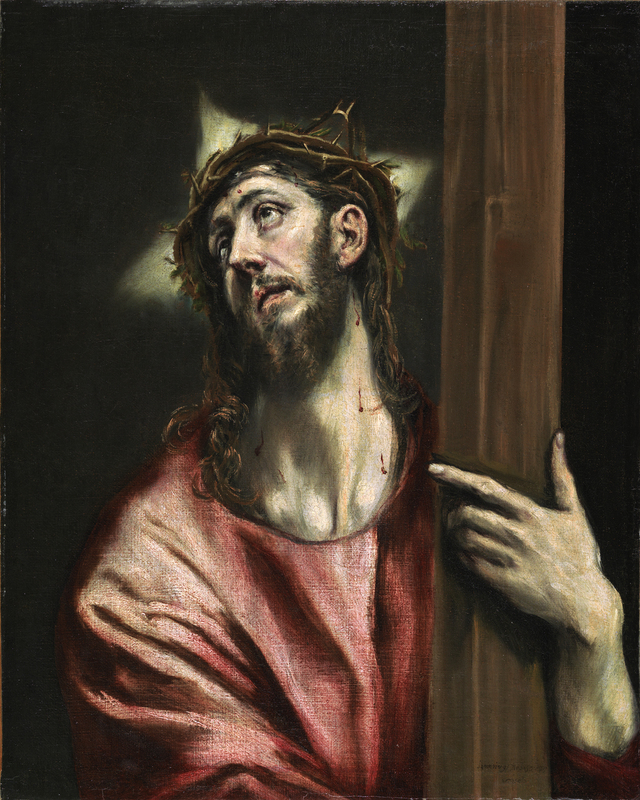 Christ holding the cross was a motif that El Greco derived from the narrative of Christ’s Passion, creating an isolated image that seems to have been extremely popular with his clients to judge from the number of known autograph versions and copies. As Wethey noted, the artist transformed a narrative episode into a devotional one, presenting a moment from Christ’s sacrifice that encourages the viewer to focus on his physical suffering. In these images Christ is depicted alone, standing, and bust-length or slightly more than half-length, holding the cross and wearing the crown of thorns that produces wounds from which the blood runs down his face and neck. The backgrounds of these compositions are either a dark sky or, as in the present canvas, a neutral tone that emphasises the figure and further encourages the use of the painting as a devotional image. The episode depicted, which took place during Christ’s ascent of Mount Golgotha, depicts him pausing to look up at the sky and establish a dialogue with God the Father during which he accepts his sacrifice. The result is to emphasise the spiritual aspect of this episode over the earthly, narrative one. On this issue, David Davies drew attention to the lines in the Gospel of Saint Matthew when Christ instructed the disciples on the manner in which they must follow him. Wethey distinguished three different formats within El Greco’s presentation of this subject. The first, of which there are six original versions that have small differences in the crown and Christ’s physiognomy, repeat the same composition. The second has a different type of halo, and a different slant of the head and position of the cross. In the third, of which this canvas is an example, the arms of the cross are omitted and Christ’s head turns to his right. Among artistic precedents for this episode is the composition by Sebastiano del Piombo in the Museo del Prado. Christ stands out against a dark background. Depicted bust-length with his body positioned frontally, his head is turned to his right, looking upwards. Only part of the vertical shaft of the cross is visible. In this version El Greco omits the blue cloak that Christ wears in the other two categories established by Wethey, clothing him only in the traditional red tunic. The hands are always crucial elements in these compositions. Like Christ’s face, they function to convey the emotional mood, while the beautiful manner in which they are painted emphasises their position and symbolic function. Christ’s hands have long, slender fingers of elegant proportions with the bone structure clearly visible, terminating in pearly nails that are firmly and sensitively modelled. The present painting was dated by Álvarez Lopera to around 1587–96. The canvas entered the Thyssen-Bornemisza collection in 1930. It was previously in the Imbert collection in Rome and later in the Neumans collection in Paris.